Piano Sonata in G minor, Op. 22 (1833-38) [16'04]. Three Concert Studies: Waldesrauchen, S145 (1859) [4'08]; La Leggierezza, S144 (1844) [4'48]; Gnomenreigen, S145 (1844) [3'02]. Variations in B flat minor, Op. 3 (1901-3) [12'01]. Polonaise in A flat, Op. 53 (1843) [6'58]. Rafal Blechacz was born as recently as 1985 yet he plays with a maturity beyond his years. His grasp of Schumann's difficult G minor Sonata is quite remarkable, the good recording preserving his thoughts truthfully - perhaps just a touch more body on the treble would have been good. Blechacz presents the opening with a balance of classical restraint and Romantic outpouring. The Andantino is an oasis of peace, tranquil and whispered confidences - Blechacz may be capable of even more intimacy than he displays here. The finale tends towards the dry-of-pedal, but not harmfully so and if the very close is identifiably studio-bound, it gives a useful pointer as to what young Blechacz may be capable of in a live setting. The Liszt Studies are a pleasure. Waldesrauchen is nicely atmospheric (although Arrau � Philips- remains a firm first recommendation), finding Blechacz revelling in the proto-Impressionistic textures. If La leggierezza is not as natural as in some hands - the unparalleled Simon Barere on APR6002 � the complete HMV recordings 1934-6 here takes Gold - Gnomenreigen (translated in the booklet as 'A Gnome Pageant' as opposed to the more usual 'Round Dance of the Gnomes') is better. Just a tad more speed and less attention to the ever-critical microphone would have freed Blechacz to express himself fully. Blechacz seems to enjoy the challenges of the Debussy, seeing real emotive weight in the expressive harmonies themselves. His Menuet borders on the cheeky, while his Clair de lune is magnificently unhackneyed. His left-hand staccato for the final Passapied is given with marvellously even and careful touch. Perhaps the most interesting aspect of this recital is Szymanowski's Variations in B flat minor, Op. 3. An early work, the Theme (original) is given out in the barest of fashions - it seems to show affinity with late Liszt - but sonorities soon become perfumed. There is a melting freedom to the composer's fluidity of invention that Bechacz reacts to in the most natural of fashions. 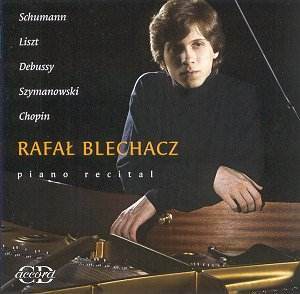 Continuing the patriotic theme, Chopin's A flat Polonaise finds Blechacz is more robust mood. There is real determination to the opening, an opening that thirty seconds later blossoms into great chordal outbursts. The infamous octaves cause Blechacz no problems at all. I look forward to hearing more from this young man.